This month before all the fashion weeks started. I started off the fashion month with being interviewed, by Allysha Johnson. 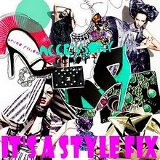 Allysha is a blogger for It's A Style Fix, Student and Future Designer/Fashion Writer. The interview was about fashion, style, editors and all the latest on fashion week and designers...Plus it was her first interview with me. Allysha it was excellent! Even I don't like interviewing people. **TIP: However you get the hand of it, it becoming second nature to you. Practice makes perfection.